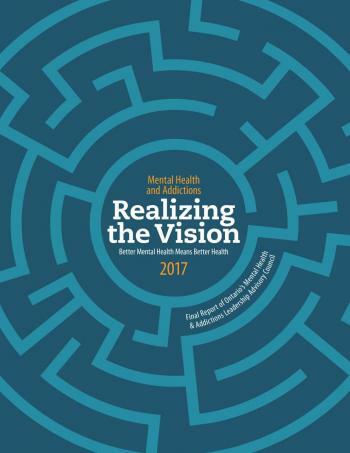 The Council was established in 2014 to provide the Minister of Health and Long-Term Care with strategic advice to fulfill the vision outlined in Open Minds Healthy Minds (2011), the government’s ten-year strategy to build a comprehensive mental health and addictions system in Ontario. In this report, the Council offers five final recommendations while also highlighting the conditions the Council believes will be critical to success, and provide potential directions for future consideration by the ministry. Promote, prevent and intervene early. That the Ministry of Health and Long-Term Care adopt 5in5 THRIVE, the Mental Health Promotion, Prevention and Early Intervention Action Framework, and use this as a starting point for collaboration with other ministries, governments, and stakeholder organizations to build a coordinated, comprehensive and systematic approach to promotion, prevention and early intervention, and to develop public interest in population wellness. Close critical service gaps. That the Ministry of Health and Long-Term Care continue to address chronic gaps in youth addictions, psychotherapy, and supportive housing. Build foundations for system transformation. That the Ministry of Health and Long-Term Care take action toward enhanced governance, equitable access to services, and youth policy reform as key foundations for system transformation. The approach − critical conditions for success. That the Ministry of Health and Long-Term Care ensure that policies, programs, and practices be developed and implemented in alignment with key guiding principles for system excellence. The path forward − future considerations. That the Ministry of Health and Long-Term Care pursue further study of, and address, additional areas of concern identified by the Council. Read the Council's final report.